CMR College of Pharmacy, Hyderabad has advertised in DECCAN CHRONICLE newspaper for the recruitment of Teaching Faculty- Assistant Professor jobs vacancies. Interested and eligible job aspirants are requested to walk-in on 24th June 2018. Check out further more details below. About College: Institute Mission- To foster professional graduates to grow personally, professionally and achieve excellence through modern skills, scientific knowledge and leadership qualities for the benefit of global society. 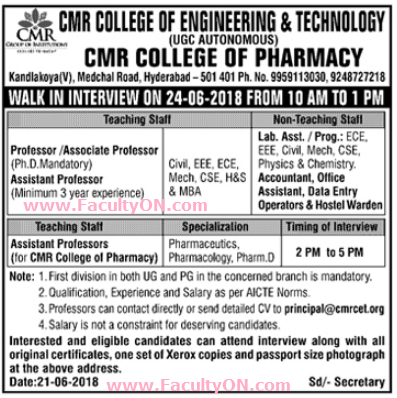 Reference: Advertisement from CMR College of Pharmacy, Hyderabad on DECCAN CHRONICLE newspaper dated 21st June 2018 for the recruitment of vacancy position such as Assistant Professor faculty jobs. See the copy of advt below.